Using the netbooks provided by the school, fifth graders Kelly Hung and Brandon Singer completed their research on zoology as a teacher pointed out key terms on the SMARTboard in front of the class. “We can do experiments,” said Kelly as she started to explain why she enjoyed having access to a computer instead of a textbook. The fifth graders are part of a pilot program in its second year at Southwood Elementary, one of three Kentwood Public Schools trying the approach. The program for fourth and fifth grades provides each grade (of about 55 students) with a lead teacher and two additional certified teachers, called interventionists, who provide support to students throughout the class. The program allows for students to have core classes, math, language arts, etc., while also providing them with time for “specials” such as arts and music. During the school day, students divide into smaller groups in each academic area. Some groups are ready to move faster and have mastered their assigned material, while others will take more time and get extra help. The groups are rearranged often to make sure all students continue moving forward. This pilot program came about as administrators faced deep budget cuts that would force them to increase class sizes. Instead, they came up with the plan that allows them to pay a daily rate to the interventionists, saving about $400,000 in salary and benefits. “We were looking at our class sizes continuing to increase and middle school scores weren’t as good,” said Principal Jeff Overkleeft. “This program allows us to better (customize) classes… so we can offer support to those who need it and to also enrich students who are ahead. The program also provides teachers with 45 minutes of collaborative planning time, which on a particular day teacher Stephanie Poll and interventionists Rebecca Wright and Jenna Engel used to discuss strategies to help students struggling with writing. After digging through a folder, Poll pulled out a sheet with questions and beginning of sentences that could help a student get started when writing an essay. “I think having that framework would help them a lot,” Poll said as she continued leading the group through the next day’s lessons. 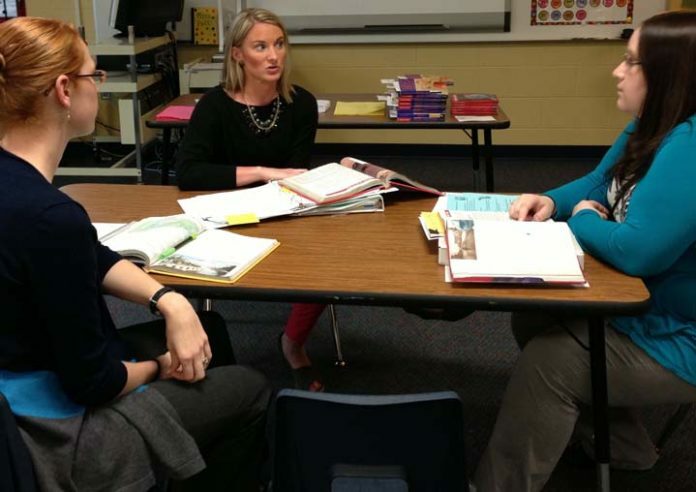 Shari Pittenger, the other lead teacher at Southwood, was among those presenting the pilot program at the Michigan Department of Education earlier this month. She said the program allows educators to have smaller class sizes and the ability to have flexible grouping so teachers can meet all students at the level they are at. The system seems to be working. Sixth graders who participated in the program last year did perform better than their peers in MEAP tests. Southwood Elementary was one of three Kentwood schools recognized last year as “Beating the Odds” schools, those recognized by the state because they have outperformed schools with similar risk factors and demographics.